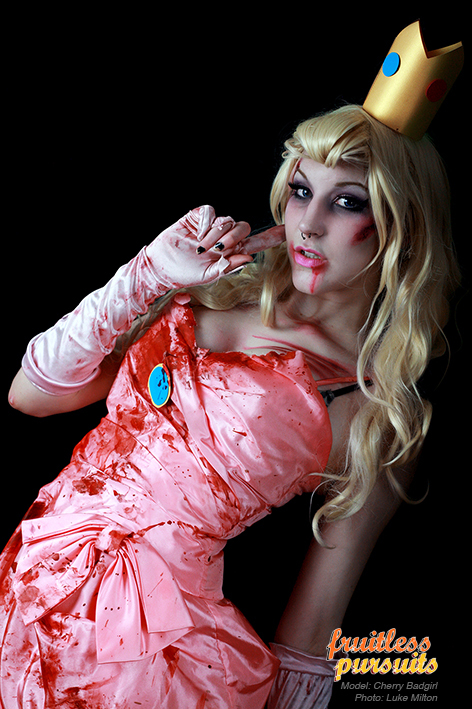 Fruitless Pursuits: My Zombie Peach Photo Shoot! I recently shared my Black Widow photo shoot, so I figured it might be apropos to also share my latest foray into photographing cosplay which took place this past weekend. I got to shoot a Zombie Princess Peach with model Cherry Badgirl, who was the genius behind the concept, the make-up and the styling while I stood around like an idiot and pressed the shutter button. More rapidly decomposing Peach after the jump! I'll be doing a lot more pop culture themed shoots in the coming months, so if you'd like to see more of these, let me know, and if you're local and want to shoot one, let me know as well!